President Moon Jae-in and North Korean leader Kim Jong-un are set to meet for the third time from Sept. 18 to 20, in Pyongyang. 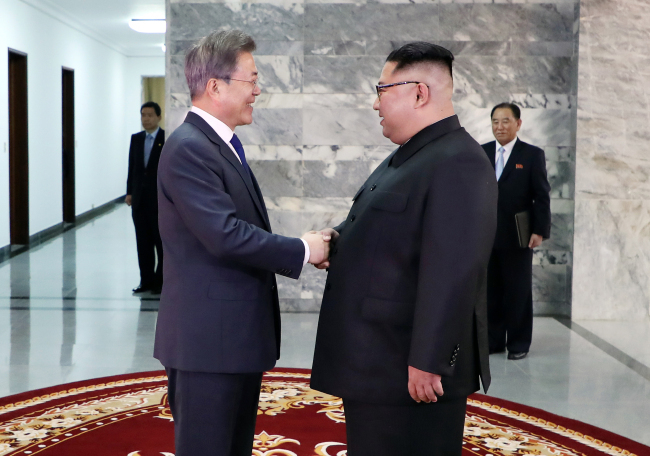 The two leaders first met on the South Korean side of Panmunjom on April 27, marking the first time a North Korean leader had set foot south of the border. Their second meeting took place on May 26 on the North’s side of Panmunjom, and the meeting was made public only after the fact. Their third meeting comes amid stalled US-North Korea denuclearization talks, with the bigger issue of US-China relations looming over it. “The summit will deal with establishing permanent peace, and achieving shared prosperity on the Korean Peninsula, and in particular, practical steps for denuclearization,” Seoul’s National Security Office chief Chung Eui-yong said. Conservative experts, however, have raised caution. “(The summit) will have significant effects on South Korea’s foreign relations in the future,” said Konyang University professor emeritus Kim Tae-woo, former head of the Korea Institute for National Unification, adding that the summit is unlikely to have much impact on the denuclearization issue. Listing recent events such as the UN Command’s disallowing the two Koreas from conducting a joint inspection of a rail network, and Washington’s reported disagreement with opening a liaison office, Kim said that the summit could affect South Korea-US relations.